The Mineral County Historical Society (MCHS) will host an open house on Saturday, April 6, to unveil its new local history museum in Keyser. The museum is located at 253 Carskadon Lane, in the back of Dr. James Courrier's dental office building. The event begins with an 11:00 a.m. ribbon cutting followed by an open house until 2:00 p.m.
"Mineral County has a rich and interesting history," MCHS president Cindy Pyles said. "We have assembled an impressive collection of artifacts and photographs which will make that history come alive. We invite the community to join us on April 6 to celebrate this grand opening with fellowship and light refreshments. It's also a chance to get a first look at what we believe will be a valuable addition to Keyser and Mineral County," Pyles added. 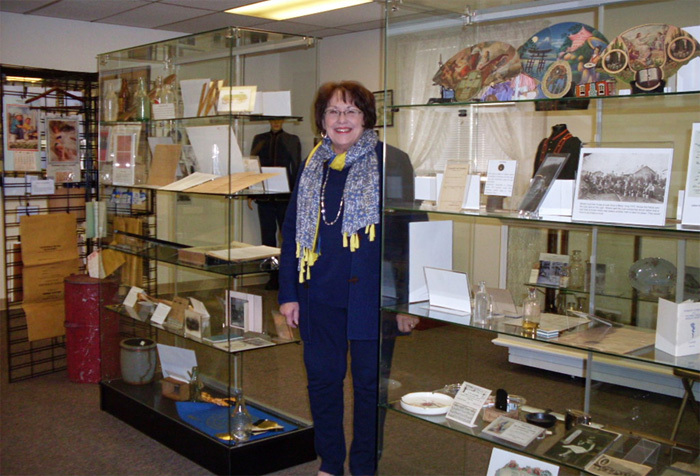 Long-time local historian, Dinah Courrier, heads the Society's museum planning committee. The displays highlight many different aspects of county history, including railroads and mining; education, music and medicine; along with influential individuals such as Thomas R. Carskadon, Henry Gassaway Davis, Nancy Hanks and Jack Rollins. The museum also includes displays that feature advertising for local business and industry; the eleven sites on the county's historic register; and the communities of Piedmont, Ridgeley, Burlington and Elk Garden. "It's a work in progress," Courrier said. "We will continue to seek and accept new items to enhance the collection and tell our story in more depth and detail." Start-up support for the museum project included major grants from the US WindForce Foundation and Rotary International. "We're grateful to many organizations and individuals whose contributions and hard work have brought this project to fruition," Pyles said. "Yet we still need more interested volunteers to help staff the museum and open it to the public on a regular basis." The location of the new Mineral County Historical Society Museum is clearly marked by a large sign at the corner of Lynmar Street and Carskadon Lane. An additional sign on the building points visitors to the entrance. For additional information, contact Dinah Courrier at 304-788-1450.